Statements and behaviour of Georgian authorities show their determination to go ahead with the construction of the huge Khudoni dam that would displace more than 2000 indigenious Svans, regardless of public protests. At the same time the project company’s set-up raises questions about ulterior motives. Svaneti, a Georgian region full of gorgeous mountains 5 000 metres high makes an overwhelming impression on any visitor. Svans, the indigenous people of Svaneti, live in the mountains since the days of Greek Geographer Strabo. But more than 2000 of them may lose their homes as Georgian officials are selling off their land to international investors to enable the construction of the Khudoni hydropower plant – a 700 megawatt, USD 1.2 billion project. Last week, I joined my Georgian colleague Dato Chipashvili on a trip to Svaneti and had to witness how little chance locals have to make their opposition heard before the project is being pushed through against their will. The most immediate impact of Khudoni dam is the flooding of several settlements and the inevitable resettlement of more than 2000 native Svans from the area (one sixth to one seventh of the population of Upper Svaneti), who have resisted the project for 30 years already. The connection to their land is strong among the Svans, which is no surprise considering the beauty of the region. But land rights have been a problematic issue in Georgia. While in recent years local authorities have blocked Svans from registering their property, many land plots under customary use by the Svans have been sold off for one dollar to the investor Transelectrica, a company that is registered in a tax haven and that has been criticised for its non-transparent ownership. Since the Khudoni project hopes for funding from multilateral development banks (the World Bank has been involved, the European Bank for Reconstruction and Development has been approached), or international banks who follow Equator Principles, locals have to be involved in the decision making according to “international standards” for public participation. Yet, what I saw was below any imaginable standard. On September 17, a public hearing for the Environmental and Social Impact Assessment (ESIA) of the Khudoni dam took place in the town of Khaishi, that will be flooded along with several other settlements. 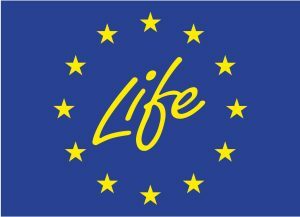 The public hearing should (in theory) inform developers, investors and Georgian decision-makers whether and how well the interests of affected communities or environment are being taken into account in the project decision and design. The Ministry for Environmental Protection and Natural Resources can, on the basis of the ESIA documentation, block the project. The way the meeting was organised and held, however, showed that the interest of locals are rather seen as a hindrance for than as a part of Georgia’s development. 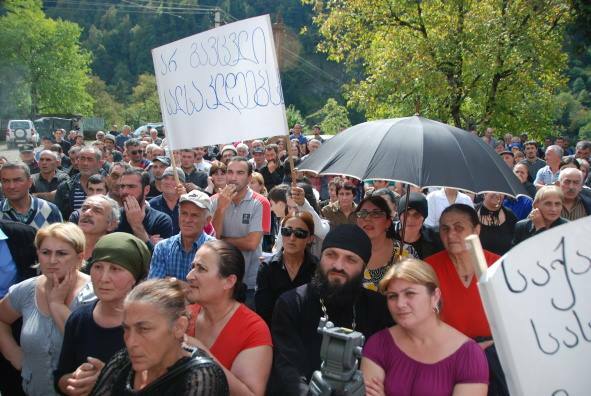 Locals told us that on the same day the director of Transelectrica Paata Tsereteli and the deputy head of the regional police department Giga Khufacaria visited a local meeting in Kaishi to warn locals not to “disturb” the public hearing and not use posters or banners against the project. Policemen had gathered at the local police station since the morning of the meeting. Some of them were even equipped with machine guns, and approximately 40 were not from Kaishi. When I asked the police spokesperson why so many of them had gathered at the time of a public hearing he told me this was regular meeting of police from the region and that it happens every month. Villagers who overheard this told me later that they had never seen so many policemen in their police station. Numerous policemen were later also present in the meeting room – a fact that could have been intimidating to local participants. The meeting room was too small to accommodate the large number of participants. Seating opportunities were very limited, even though there were large number elderly people or people with young children. The locals therefore requested for the meeting to take place in front of the building, but without adequate sound equipment, this did not improve the situation significantly. After 3 hours, the meeting resumed inside, but hardly any locals had came to the room and it was filled with representatives of the investor, consultants, government officials and most of the police officers. The locals who boycotted presentation that started inside feared that this situation could be misused by investor and asked to end the meeting. That the sponsor of a USD 1.2 billion project is not able or willing to arrange for a proper location and a few benches speaks volumes about the willingness to engage with affected communities. 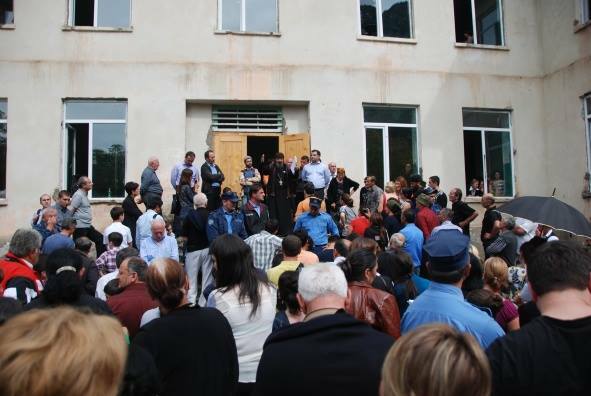 Half an hour before the public hearing, deputy minister of energy Ilia Eloshvilli told the people gathered in front of the building that “the dam will be built anyway” – a vivid example of how government officials don’t take the ESIA decision making process and thus environmental and social safeguards seriously. 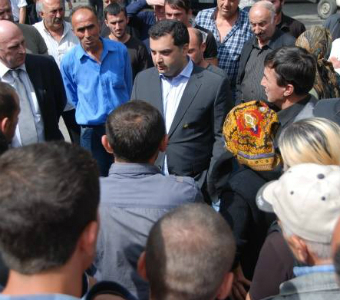 Deputy minister of energy Ilia Eloshvilli surrounded by locals. The fierce interest of Georgian authorities in the project further became apparent during the meeting, when Eloshvilli – and not the representatives of the investor – became the main speaker and argued heatedly with everyone raising concerns instead of listening to people whose homes are to be bulldozed by the project. David Mirtskhulava (left), the technical Director of Transelectrica and former minister of energy. That the Ministry of Energy takes such a hard-line approach on the Khudoni dam and doesn’t consider other alternatives (like the rehabilitation of other Georgian dams, or building a smaller dam as locals propose) has raised question about the motives of officials and some speculate about corruption or future posts in the project company. There is a wide revolving door between Georgia’s energy sector and its political class: A former minister of energy, David Mirtskhulava – who used to be called the “Minister of No-Electricity” because of frequent black-outs during his term – is now the technical director of Transelectrica. The current minister Kakha Kaladze, a former football player, was (and potentially still is) an investor in Georgia’s energy and natural resources sector. While statements by Georgian officials are full of Georgia’s national interest, the people in Khaishi, Vedi, Tobari and other settlements are left on their own. They need to collect money if they want their roads to be repaired, they apparently maintain their electricity grids by themselves. Their land was sold to the investor for one dollar and their ears are filled with empty promises that defy the official rhetoric. It is no surprise then, that people in Svaneti passionately oppose the project.